Peaceful Reader: Oh, Saturday I Embrace You!! I'm going to use this man, Drew Kime's help. 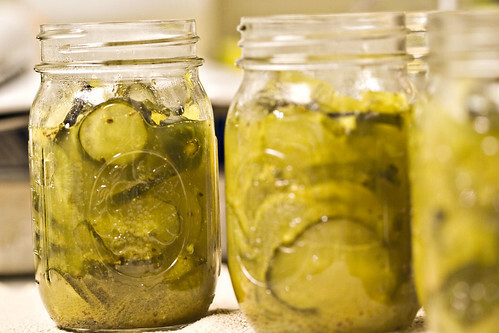 When I googled bread and butter pickles his site, How to Cook Like Your Grandmother appealed to me on a soulful level. Plus he has pictures and a sense of humor (or at least he writes with one.) I have about 10 projects I am trying to finish up to give me a sense of satisfaction for my summer: How many do you think I can complete this weekend??? Yesterday I took my kids on a school shopping adventure to the Mall where we visited many stores and had a late lunch/early dinner in between. We found a backpack for my tiny dancer at The Children's Place-she picked from the "boy" rack of BP's- a purple/blue choice with skull and crossbones! Hey, I'm so glad she took a step away from pink and picked something so unique. At the inexpensive shoe place she found slip-on sneakers that (almost) match. I didn't want to mention they were boy's as well but hey, she loves them. For her gym shoes she did pick white ones with a silvery/sparkly swoosh so she hasn't completely gone over to the darkside. Teen-age boy was in a good mood (you know that's rare if you also have a teenager:) and found sneakers he could live with at the more expensive shoe place but they were on sale so it was a go! I have a new dress code policy this year (I cannot go into details because it really mortifies me that I have a master's degree and someone far superior to me has to tell me how to dress-well, it just raised my hackles) I can say it... "I have trouble with conformity." We cannot wear "open-toed shoes" to school so no fancy sandals to match the heat. I had to shoe shop a little and found a great pair of Merrell's on sale. Does anyone else work in a school district that dictates what you wear?? Share with me please so I can have a little hope that this too shall pass and I will live through it unscathed! Truly it's hard to be calm about this! I have several finished books to discuss (The Girl Who Played with Fire, Rainbow Jordan and The Girl Who Could Fly) and have to finish That Crumpled Paper Was Due Last Week before our family meeting on Tuesday night. After today I hope to cross off number one on the list; bread and butter pickles!! I think I can, I think I can, I think I can! I hope mine will look half as good as the picture at the top and still be edible. So what do you have planned for this glorious Saturday? ?